It begins on the shaded town square in a sleepy Southern town. A spirited seven-year-old has a brisk business at her lemonade stand. Her latest customer, a bearded stranger, drains his cup and heads to his car, his mind on a boat he's restoring at a nearby lake. But the little girl's pretty yellow dress can't quite hide the ugly scar on her chest. The stranger understands more about it than he wants to admit. And the beat-up bread truck careening around the corner with its radio blaring is about to change the trajectory of both their lives. Before it's over, they'll both know there are painful reasons why crickets cry...and that miracles lurk around unexpected corners. By choice, Reese Mitchell lived a secluded life on Lake Burton off the Tallulah River after the devastating loss of his wife. His brother-in-law was his only companion, and he liked it that way. A chance encounter with seven-year-old Annie forces him to make another choice. Life or death--hers. Reese knows he holds the answer in his hands. As Annie awaits a heart transplant, she is loved by the whole town. Her lemonade stand raises thousands of dollars despite the fifty-cent a cup charge. Will she survive her wait? Aunt Cindy is ravaged by the burden of caring for her niece Annie after the death of her sister. The extensive needs of the child have worn her down. Her heart, too, is damaged. She needs a friend--a friend in the person of Reese Mitchell. Will Reese lose his anonymity and repair the damage to two hearts? Or will it prove too much of a risk for him? Charles Martin's poignant style causes a reader to grab a cup of coffee, settle back and be enveloped in the South. Armchair Interviews says: Martin's moving descriptions and grasp of human emotions and frailties will rocket this novel up the charts. I love inspirational books, but don't like being preached at. When someone recommended this book to my online book club to read, I thought, I needed something new to try. I honestly did not expect this book to be as good as it is. I thought it was going to be a good story and that's it. I was wrong. This book is definitely one of the better fiction I have yet to read in a long time. I couldn't put it down. It is written so compellingly and so beautifully, that it is a novel that will tug at your heart strings. It will make you look at your life a little bit differently and perhaps make you count your blessings a little bit more. This novel is about Reese, a man with a great secret from his past, who meets up with this little girl selling lemonade on the street. It starts out so innocently and so sweetly, that you're taken for a ride along the southern streets before you realize that you're in so deep of the story that you just can't get away so easily. This novel is about a man who lost his wife tragically and hasn't been able to find his way back to the light. This novel is about a little girl who helps him find his way back and remind him that life does continue to go on ever so sweetly and sour like a lemonade. When life hands you lemons, you just have to make lemonade. I was not expecting a whole lot from this novel and to my amazement, I have found another author to read and to recommend. This novel is a beautiful testimony to one man's faith in all things good and beautiful. And don't worry, there's no preaching here. It is just a good story to get lost into. This is a great book, as all of Charles Martin's books are. It will also make a reader cry. Where do I begin, our bookclub at Church read this book and it was the first time I read anything by Charles Martin. The book had me from the first page. I was mesmerized by the detail and research Charles put into the book. Saturday our bookclub went to Clayton, GA where the story took place, we ACTUALLY met and got our book signed as well as purchased his latest book. What a class act! He was so personable, honest and has a great memory for names. We met at Persimmons discussed the book, took pictures and walked where the story began (Savannah and Main). Even took pictures of the cricket box outside of Reeves. We later had lunch on the Lake. It was a wonderful day for us all. The book hit home in many areas, friendship, forgiveness, love and restoration. I'm personally using this author for Christmas gifts this year and looking forward to reading all his other books. You won't be sorry with this purchase, it's been a long time since I found fiction to be so inspirational! Thank you Charles, the pleasure of meeting you was ours. "She craned her neck, stretched high on her tiptoes, and cupped her hands to her mouth. Lemonaaade! Lemonaaaaade, fifty cents. The Lemonade stand was sturdy and well worn, but hastily made." This novel was written from the heart and soul of this brilliant writer. A page-turner, which does not let you go, this is a passionate work that will bring a tear to your eye from time to time. Will be highly recommending When Crickets Cry to my friends and all other bookworms. This is indeed a keepsake and will be a wonderful gift for any occasion. When Crickets Cry is a book about the heart. It's a book about that funky-looking muscle in our chests that pumps the blood throughout our bodies. It's a book about that ephemeral thing we call the heart when we speak about love and passion. It's a book about the place where the two--that muscle and other thing--intersect. It's also one of the best books I've been asked to review, and certainly the best one this year! Reese Mitch is a guy who works on boats on a lake in Georgia. Expensive boats owned by rich people who can afford to pay someone else lots of money to refurbish what would probably look to most of us like an old tub. With his blind brother-in-law Charlie as his partner, Reese's skills are in high demand. There's more to Reese than meets the eye, though. For one thing, he used to be married. And he used to be a phenomenal heart surgeon. But no one in this little corner of Georgia knows that (except Charlie, and he's willing to keep quiet). To them, Reese is just that strange, vagrant-looking guy ... until one day when he saves the life of Annie, a seven year old little girl who needs a heart transplant as is everyone's favorite lemonade saleswoman. With flashbacks and details (about heart surgery, rowing, and boat repair), When Crickets Cry tells a story--the story--of the human heart and it's enormous capacity and resilience. The story starts slow, but still drew me along, rather like a slow fishing boat trying to pull a skier aloft. But that's just part of the overall motif. Like a diseased heart (and I mean that in the best possible way), this book starts slow, then builds to a fevered pitch as the heart beats harder and harder, faster and faster. Southern writing, for whatever reason, generally involves a slower pace--if not to the writing, to the story telling. Like the southern guy at the campfire who can enthrall an audience for hours with a good story, Martin draws the reader in and, rather than pulling him slowly along behind the boat, eventually puts him in the seat right beside him, finally pushing the reader almost ahead of the writing. My only quibble with the writing--and believe me it is extremely minor--on a few occasions Martins descriptions (of heart surgery theory, of competition rowing and of boat repair) go in for more detail than I, personally needed. They don't really distract from the book, but for this reader they could have been whittled down (or even excised) and the book would not have lost anything. The main characters in this book all have an unwavering faith in God and a wonder for his works that fuels them even when it would seem reasonable to give up. They all seem to have a better than average grasp of scripture (and Shakespeare and a few other quotable people). As a Christian, then, I read this story and see in it a parable for how God works on peoples hearts (physically and spiritually). It should be noted, however--and this is not criticism--that if a person is reading this book in hopes of finding God's love presented by a "pastor" or a church, she won't find it. All the Christians in the book carry out their ministry and the closest thing to a church in the story is a road-house (that's not a slam, either, you have to read the book to understand). Give your heart a work-out and read When Crickets Cry. Charles Martin's books are the best I have found in a long time. Each one is different, but the development of the story and character bring you right into the story, and you don't want to put the book down! When Crickets Cry is an amazing story of love and faith. His books are different. Even though I don't like to say good-bye to characters at the end of a good book, I have grown tired of Christian fiction that turn books into never-ending series. Mr. Martin is able to develop his characters fully, as well as a story that will tug at your heartstrings, bringing many emotions to the surface, tears of sadness and also tears of joy. As Christian fiction, the characters are not sugary sweet, they have faults and doubts and fears like normal people do. But through all the trials, you can see their faith, even as they struggle with it. I was very disappointed in several factors on this book: First it was too stretched out...went on and on to the point of bordom. second: the ending was too short and unexplained. How the last minute finding was unrealistic. He spent all his life studying for his wife's benefit and then making the decision he did when he constantly stated she was serious. and finally the very end was "that's all folks". Did he have a deadline to keep? Just can't figure out the end. Doesn't make sense. After a personal tragedy struck many years ago, Reese has taken up a hermit-like existence. Holed up in his lakeside home with only his friend Charlie to keep him company, Reese seems destined to live out the rest of his life as a bitter and isolated man. But one morning on a brief visit to town, he meets a little girl called Annie. Soon Reese is forced to confront his past and is slowly drawn back into the life he thought he left behind. As might be expected from the subtitle, When Crickets Cry is indeed a novel of the heart. The book is devoted to both the physical and emotional kind of heart, specifically those that are diseased or broken. That theme permeates everything from detailed descriptions about how a heart works (Martin obviously did his research), sentimental musings about how non-physical hearts heal, to the addition of calorie ridden burgers called Transplants at the local bar. In the back of the book, there is even a page from the author about a When Cricket's Cry heart care fund. On the plus side, Martin does populate his book with a cast of quirky characters. Shadowy Reese, garrulous Charlie, long suffering Annie, fiscally struggling aunt Cindy, and David Stipes, the owner of a Christian "bar" all help to keep the reader's interest and move the story along. However, a collection of small issues kept me from fully enjoying in the book. Martin tends to tell us how much pain the characters feel rather than show it. Or when they do show it, they do so in floods of tears. Cindy, in particular, spends half the book crying on Reese's shoulder on the verge of a breakdown. They seem to stumble upon the answers to their problems rather than proactively seek them. Instead of truly getting a change of heart, Reese seems to rather be forced to change by circumstance. We are filled in on Reeses's past in a series of flashbacks. The first few are informative but the rest tend to just add filler. Unfortunately, all the time spend on the past shortchanges the ending which is resolved in a very anticlimactic and quick manner. As a whole, the prose flows quite well but there was a tendency toward odd and unwieldy metaphors and similes. "if Annie had knocked on my city gate that day at the lemonade stand, then she'd just splintered it with the battering ram that was her heart." Only recommended for staunch fans of inspirational fiction or sentimental drama. Published three years ago, "When Crickets Cry" is the story of Reese Mitch, a guy doing carpentry and contruction work who buys a glass of lemonade on a street corner from a little girl named Annie. Annie parents are dead, and she lives with her aunt, Cindy McReedy. Some of Annie's lemonade money blows into the street, she runs to get it, and is hit by a truck. And Reese's life is never the same. Gradually, Martin tells two stories. One is Annie's. She's 11 years old and needs a new heart. The other story is Reese's. Gradually the reader learns that Reese is something far more than what he appears to be. And he's never recovered from the loss of his wife Emma, who died waiting for a heart transplant. Reese lives near Emma's brother Charlie; Charlie is blind for reasons that only eventually become clear. 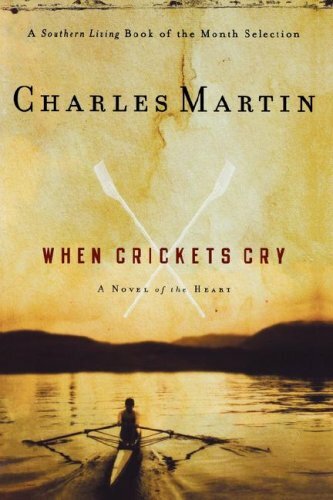 When Crickets Cry is fully recognizable as a Charles Martin book. His writing is about place, and place is almost always a main character in itself in his stories. His novels are about broken people, people seeking healing and redemption. There are always surprises, twists and turns. There's usually a child in there somewhere. And often physical illness. But for all of the recognizable signs, his novels are not formulaic. "The Dead Don't Dance" and "Maggie" are about a couple trying to have a child. "Wrapped in Rain" is a story of two brothers, half-brothers, actually, each dealing and trying to overcome a childhood of abuse. "Chasing Fireflies" is about family secrets and a man's awful longing for a father he never knew. And then there's this novel, "When Crickets Cry." The writing is powerful, achingly so. The reader feels Reese's pain and Annie's desire for life. The characters, all of them, are drawn true -- you recognize and know these people, and more than that, you care about them. And while you learn a lot about the human heart as a physical entity, you also understand that it is far more than that. I read a lot and this is one of the best books I have ever read. It's spiritual without being "religious". I intend to read all of Charles Martin's books. I would rate this book as excellent. This book will grab your heart and won't let go until long after you've read the last page, leaving fingerprints as a reminder of what matters most in life. You will breathe and bleed and cry for Reese and Emma ... Reese and Annie ... Reese and Charlie ... Reese and Cindy -- each pair sharing heart-healing actions with each other. The book's messages arrive with felt force, like the resilient beat of a healthy heart, over and over and over ... reminding us that the heart offers redemption and renewal through an unknowable life-force that transforms as it purifies. Like the heart, this book has a pulse and a heartbeat that you will feel. Charles Martin possesses a great talent for thoroughly developing his characters and making his readers feel for them. This was the first novel in a long, long time that brought tears to my eyes. It's that good. "When Crickets Cry" is a first-person narrative told by Jonathan Reese Mitchell, a thirty-something heart surgeon who is running away from himself and his past. He has secluded himself on Lake Burton in Clayton, Georgia, virtually "disappearing" from his former life as a high-profile surgeon. The only person who knows about his past is his blind brother-in-law, who lives in a lakeside cabin nearby. The novel begins as Reese sees Annie, a 7-year-old girl, selling lemonade in the small town square near Lake Burton. As Reese looks closer, he sees a vertical scar below the little girl's neckline, and it disappears down her dress. Reese knows what that means. Taking pity on the girl, he buys some lemonade and places a generous donation in her bucket. But Reese is about to become irrevocably linked to that little girl. Wind blows some of her cash into the street, and when Annie runs after the money, she is struck by a bread truck. Reese's quick thinking saves her life while bystanders call 911 and wait for an ambulance. But Reese doesn't let on who he really is. He finds himself helping Annie and her aunt Cindy by driving them to the hospital, taking them for boat rides on the lake, buying dinner for them...all to soothe his own conscience. Reese battles his conscience every day because, five years ago, his wife died at the young age of 30. Reese had spent his whole life learning about the heart in an effort to save Emma, his childhood friend who became his high school sweetheart and, eventually, his wife. Emma's heart was badly diseased and in dire need of a transplant. Reese blames himself for her death because he "couldn't save her," and he isn't able to forgive himself. He also blames himself for his brother-in-law's blindness through a freak accident. The reader learns about Reese's past through a series of flashbacks that are effectively woven into Reese's present-day life of seclusion on Lake Burton. The story is about Reese coming to terms with himself and his past in order to help little Annie. It's heartbreaking, but it's so good. The novel has depth that ten years ago would have been unheard of in the Christian fiction genre. In addition, Martin doesn't preach at his reader. No, not once. His intention is to tell a story, and that's exactly what he does. Charles Martin is fabulous. I'll be watching him closely from now on. A moving story about and from the Heart. I was drawn to this book after hearing an interview on a Christian radio station with the author Charles Martin. His commitment to good story telling with characters that touch your heart and witness to you about God, Christ and Faith is very compelling to Christian readers and those who are still searching for God. I did find some of the situations in the story to be almost too dramatic and coincidental. While they served to build up to a climax and added to the drama of the story, I wondered if the story could have stood well without them. Don't get me wrong, this is a very good read and few will get through this book without being touched by tears, laughter and a deep appreciation for life, family, love and God, the creater of all life. People who love a good Medical drama will appreciate the attention to medical facts about our hearts and how the body relies on this magnificantly crafted organ. I am not able to speak to the total accuracy of the information, but I felt it rang true and that Mr. Martin did his homework on this one. I read this after being away from my family on a business trip. I discovered the book while I was still away and ordered it to arrive when I got back home. A week later I was finishing the book in the hospital the day my second child was born. My wife was okay with this as we both had resting time while the staff took good care of both of us. Bottom line? Buy it, read it and let the message of faith, God's love for us and the mystery of life sink in. I would tell you about the characters, but you can get a glimps of this online at [...]I will tell you that Annie will steal your heart forever.